We checked in with some of our favorite spots sporting proper names to find out the stories behind their monikers. 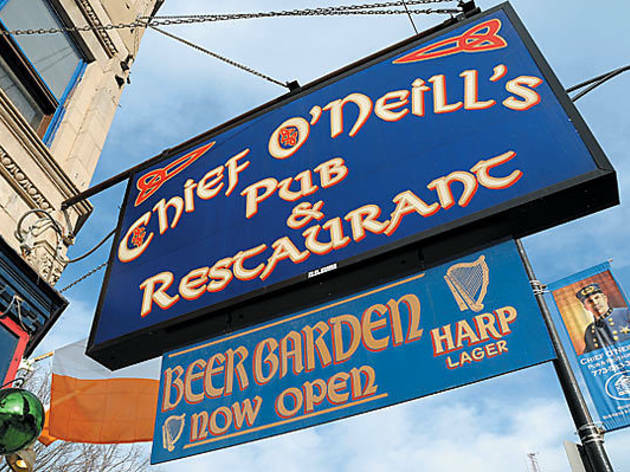 Chief O’Neill’s Pub (3471 N Elston Ave, 773-583-3066) Francis O’Neill was the local chief of police in the early 1900s, but that isn’t why Siobhan McKinney and her husband, both Irish musicians, decided to name their pub after him. “We honor him because of his contribution to Irish music,” she says, which includes O’ Neill’s Music of Ireland, a book of 1,850 Irish songs. Guthrie’s Tavern (1300 W Addison St, 773-477-2900) This haven for board-game players offers a respite from Wrigleyville debauchery, but its namesake would probably be happy to see Lakeview as it exists today. “[The bar] is named after a area developer in the 1800s, J.B. Guthrie,” explains bartender Chris Merle. Harold’s Chicken Shack (locations throughout the city) There’s more to the signs for Harold’s Chicken Shacks than a machete-wielding cook chasing a chicken; they honor Harold Pierce, who founded the chain in 1950. In the late ’40s Pierce ran a restaurant featuring chicken feet and dumplings on 39th Street and got the idea to fry up the whole bird from pal Gene Rosen. The chicken was delicious, and a dynasty was launched. Today, his daughter, Kristen Pierce, is the CEO of Harold’s Chicken Shack, Inc, which oversees licensing and new franchises. Lem’s BBQ (311 E 75th St, 773-994-2428) This barbecue joint was located at State and 9th Streets when it opened in 1953. Now on East 75th, it’s still known for its carryout rib tips. But the name? “It’s short for our name, Lemon, the family that started it,” says James Lemon, a member of the family who continues to run the place. Manny’s Coffee Shop & Deli (1141 S Jefferson St, 312-939-2855) The South-Loop, Jewish-style deli is named for the owner’s son, but with a twist. According to Dan Raskin, the great-grandson of founder Jack Raskin, Manny’s was previously a grocery store named Sunny’s. “My great-grandfather and his son spent all their money fixing up the place,” explains Raskin, so an economic decision was made to simply change two letters on the sign, and call the place Manny’s. Luckily, Jack’s son, Emmanuel, was known by the nickname Manny, so it didn’t just look like a money-saver. RoSal’s (1154 W Taylor St, 312-243-2357) When two people go into business together, there’s the inevitable question of which should get the marquee-naming honors. Little Italy natives (and married couple) Roseanne and Salvatore Perry didn’t fight it out—they compromised, combining their first names for their dream venture. Susie’s Drive-Thru (4126 W Montrose Ave, 773-283-6544) “It’s named for the owners’ daughter,” explains Stacy Ninos. She should know—her dad is Susie’s owner, Gus Ninos. 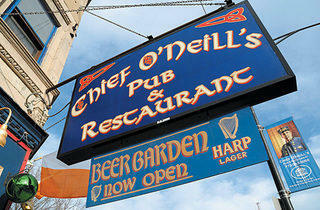 When asked why her little sis got all the love, she adds that at one point, she had a restaurant named for her as well. “The first one was named for me [the now defunct Stacy’s Diner,” she says. Sweet Mandy B’s (1208 W Webster Ave, 773-244-1174) It would be easy to imagine there’s a Mandy B hard at work behind the counter of this Lincoln Park cupcake bakery, popping trays in the oven and whipping up buttercream frosting. Easy…but incorrect. The bakery is actually named for owner Cindy Levin’s two children, Mandy and Brian (poor Brian just gets the “B”). Tuman’s Tavern (2159 W Chicago Ave, 773-782-1400) “When this place was bought out, we bought it from this guy Bill Tuman,” explains a bartender at the Ukrainian Village watering hole. Though portions of the name were dropped—“Alcohol Abuse Center” gave way to “Tavern”—the name of the original proprietor (who’s still ticking, by the way) remained when the bar changed hands six years ago. Uncle John’s BBQ (337 E 69th St, 773-892-1233) “There’s an Uncle John in the family, but we didn’t name it for that,” quips Mack Sevier, owner of this beloved barbecue takeout joint known for its hot links, which are expertly prepared by Sevier in a wood smoker. The name actually “goes with this kind of food. It’s a country name,” Sevier says. “Uncle John…it sounds like a farmer or something.” We’ll buy that.